Here is a jewelry board I made. It was very simple and easy and inexpensive. I will include the instructions on how to do this soon. 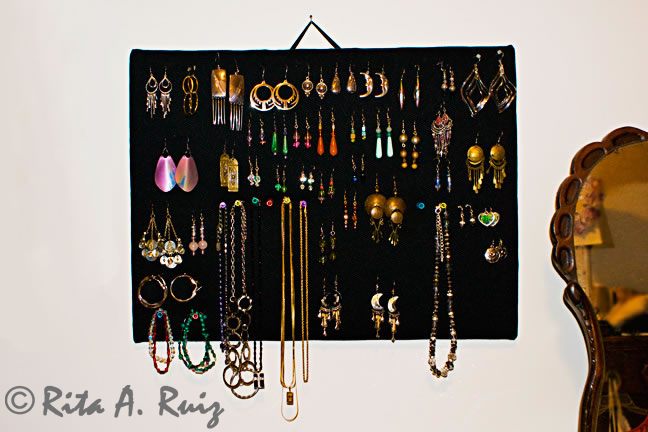 I can hang all my dangly earrings on it as well as some necklaces (keeps them from getting tangled and kinked) and bracelets. It is NOT made from corkboard. And I love the way it looks hanging in my bedroom. great idea! I need this! Yes, it’s fantastic and gets tons of use from me. I keep meaning to post the instructions to making it and just haven’t had the time. That’s a horrible excuse, I know, but the truth. I will do it, though. Hopefully, soon. Your blog is so funny! Have you stopped doing it? I just looked at it for the first time and loved it! Thanks for stopping by and commenting.